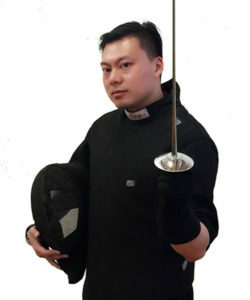 Harry began fencing at the age of 12 in his native city, Chongqing. His coach, Ruiming Zhong (former Chinese National Team Coach) helped him to become the Chinese National Champion and gold medallist in 2002 and a member of the National Foil Team 2003 and 2004. Retiring from the Chinese National Team due to injury, Harry moved to Australia in 2008. He continued to compete and won the International Tournament Men’s Foil gold medal (2008), Australian Championship Open Men’ Foil gold twice (2008 and 2009) and Robyn Chaplin Memorial Tournament Men’s Foil gold (2009). Harry has been coaching since 2007 in Hong Kong and Australia with numerous clubs and guided his students to success in a number of championships. He has a Bachelor Of Athletic Sports from Guangzhou Sport University and is a qualified fitness instructor. The General Administration of Sport, China, awarded Harry the accolade of Sports Master. This is an honour bestowed to elite athletes who have achieved a gold medal at national/international competition level. As a coach Harry believes that hard work, perseverance and determination are the drivers behind every success story.